A number of monumental events took place in 1982. South Melbourne Football Club moved to Sydney and became the Sydney Swans. Ian Thorpe, Australia’s most successful Olympian, was born into the world. Sons and Daughters was unleashed onto our television sets and went on to take out a Logie for Most Popular Australian Drama. 1982 was also a monumental year in the wine world. The 1982 vintage in Bordeaux sparked the birth of the fine wine market and, to this day, the wines from this profound vintage still turn heads and fill the cellars of many of the world’s greatest wine collectors. Today, the top wines from the 1982 vintage in Bordeaux command astronomical prices on the secondary market and are as rare as hen’s teeth. If you are lucky enough to have any in your cellar (or lucky enough to have friends with deep pockets and a love of sharing their treasures…) these wines showcase what is so magical and mystical about drinking wines with bottle age. For these great wines to have survived this long (and for them not to have turned into vinegar), careful storage has been key to their longevity, resulting in an assurance that the fruit, tannins, acidity and alcohol have come together in harmony so that when the cork is pulled, they titillate the palate of the lucky drinker. As these delectable treats march on into the fourth decade of their life, and as the constantly evolving wine market grows, there is a growing desire among wine drinkers to experience wines with bottle age. At some of the prices such wines command, there’s an ever-increasing desire to find a solution – albeit one that requires much patience – to put wine away for a rainy day in the home. But how do you know what wines will age well? How do you store the wines that you want to drink in 10 years? And most importantly, how will you resist drinking them before they reach their peak drinking window? Now, it’s important to mention at this stage that the majority of wines produced today are not made to be tucked away in your cellar for years. Modern wine making has made great strides but as a result most wines are produced in a fruit forward, easy drinking style, and are designed for immediate consumption. There is a vast array of great value everyday wines on the market today but mostly these wines lack the structure required for further ageing and should be drunk up (with gusto and glee!) within the first couple of years after vintage. Wine is a living thing and much like humans, can go from infancy through to adolescence, middle age and like some lucky souls; a few can head on into old age gracefully. Some wines in their infancy can be treacherous to drink. Wines with hard edged tannins in their youth (e.g. Cabernet Sauvignon and Nebbiolo) can seem aggressive and “clunky”. Others exhibit searingly-high acidity that when drunk too young, often attract terms like ‘battery acid’ (for the dramatic)! However, with bottle age, tannins soften and provide a framework for the wine. When acidity softens and becomes more integrated with the rest of the wine it helps bring freshness and focus to your wonderfully mature drop. Tannins, acidity and sugar and are all important factors when determining whether a wine has the ability to be cellared or not (and all act as a natural preservative), but the precise reason as to why some wines seem to age better than others isn’t fully understood. What is known, however, is that certain wines from certain producers and vintages have an amazing ability to rest undisturbed in the cellar for many years, and when the cork is finally drawn they beguile the senses with their incredible combination of tertiary fruit flavours, mouthfeel and structure that unravels in the glass to delight the lucky drinkers’ senses. Buying wines to cellar can be a tricky business, but the best way to begin to fill your cellar is to get to know producers and vintages and not be afraid to experiment. Buy a six pack, open a bottle and make a judgment call. Will this benefit from short, mid or long term cellaring? Open another bottle a couple of years down the line to see how the evolution is coming along. Drinking a wine too early can be frustrating but not as frustrating as drinking something that is over the hill and tired!! Buy good wines from good producers and from good vintages. Instead of buying Grand Cru Burgundy (which costs and arm and a leg) from an average producer, buy Village or Premier Cru from a top producer. Next tip - have a diverse cellar. Don’t forget about white wines. Riesling, Chardonnay, Gruner Veltliner and Sparkling wines hold up exceptionally well with some time in the cellar. Fill your cellar with wines that will be ready to drink at different stages. Whilst you are waiting patiently on your Penfolds Grange, top end Claret and Barolo to mature, buy wines to drink in the interim. Think Sangiovese, Barbera, Pinot Noir and Tempranillo. Main takeaway here is to look outside the box. Rather than buying from recognised areas, look to slightly lesser-known regions. As well as buying Barolo for long term cellaring, many top producers’ Langhe Nebbiolos will sit really beautifully in your cellar amongst more stellar bottles, and will not only be kinder to your wallet but will be approachable earlier. Good Chateauneuf du Pape is expensive but wines from neighbouring villages like Gigondas and Rasteau can be equally profound (and generally don’t come with the same price tag as their more illustrious cousin). Building a cellar should be fun and doesn’t have to be expensive so get experimenting and enjoy yourself in the process. You’ve bought it, now it’s time to store it right! As I mentioned, wines need a specific environment to ensure that they mature into the devilishly exciting and mature drop that you want to be drawing the cork from. Hence, a number of factors need to be taken into consideration when deciding where to house your vinous investment. Temperature, light, humidity and movement all affect how a wine ages. If you are fortunate enough to have an underground cellar, start filling it immediately with delicious drops as the temperature, light and humidity are all naturally regulated by the surrounding earth (and really….if there is excessive movement in your underground cellar or basement, the storage of your wine is probably the least of your concerns!). For many of us - particularly in the modern era of high-rise living - this style of cellaring simply isn’t an option, needless to say. However, there are a number of solutions out there that will help to ensure your wines age well and provide years of drinking pleasure. Much like humans, wine is hugely affected by temperature. Too high a temperature will lead to your wine maturing quickly and can lead to ‘stewed’ and ‘cooked’ flavours. Too cold a temperature could lead to your wine freezing, thus expanding and pushing the cork out of the bottle and allowing the ultimate enemy (oxygen) to creep into the bottle and cause the wine to oxidize. Temperature fluctuations can also be hazardous, causing the wine to expand and contract and again leading to problems with oxygen ingress. Find a spot in your house where the temperature is relatively stable. Ideally you want your wine to be maturing away in a constant temperature of between 10-15˚C. This can prove tricky, but as long as the temperature is constant, a slightly higher temperature shouldn’t have a huge effect on the wine (although it may speed up the maturation process slightly). For long term storage (and for extra special bottles) it may be wise to consider professional storage, but for mid-term cellaring, a nice constant and cool area of your house should do the trick. When storing wine bottled under cork, humidity is another factor to be aware of. If your ‘cellar’ lacks humidity, there is the danger that the cork will dry out and, once more, the dreaded foe oxygen will make its way into your bottle and slowly ensure that your special bottle is now merely an expensive bottle of balsamic. There is much debate about the effect of humidity on maturing wine, but generally if your cellar has humidity of 50—80% your wine should survive a good period of cellaring. Once more, for long term storage, professional storage could be your best option but for short to mid-term you need not worry too much. Storing wines bottled under cork on their side ensures the cork is in constant contact with the wine, keeping the cork moist and ensuring it provides a tight seal against oxygen ingress. Storing wines on their side (regardless of the type of closure) is also economical on space, and once you start cellaring wine, space quickly becomes an issue. 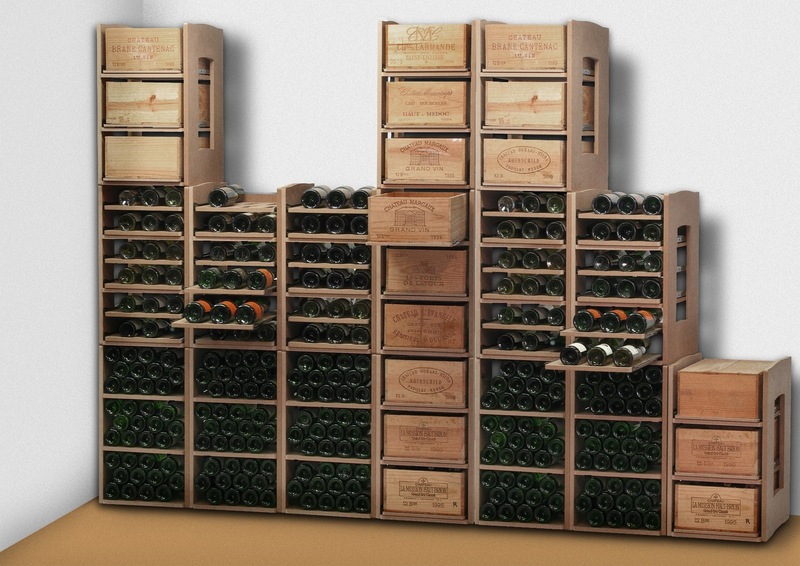 So not only is storing wine on its side advantageous for the maturation process, it ensures you can carry on adding more wine to your burgeoning collection! Strong direct light, especially UV rays from the sun, can also pose some risk to your maturing wine. UV light can have an adverse reaction on the phenolic compounds in wine and when overexposed to UV, wines can degrade and age prematurely. Normal household lights shouldn’t pose too much of a risk to the wine itself but could lead to faded labels. If you have a nice cool, dark cupboard then great but if not, try to store your wine in boxes to create a natural barrier between your bottles and the dreaded UV. Traditionally, premium wines from a number of high profile producers come lovingly packaged up in charming wooden cases, so pop down to your local merchant and ask if they have any lying around. Often these cases will be split for sale and the boxes consigned to the scrap heap. Not only do they protect your wine, they also look good (and nobody need ever know that your Grange box is filled with some slightly cheaper alternatives). There are also theories that vibrations have an adverse effect on the maturation of wines by speeding up the chemical reactions slowly taking place in the bottle. This remains today an intense area of study but has yet to be clarified with any concrete evidence. Best be safer rather than sorry though, so try to avoid storing your wine where the bottles are exposed to an inordinate amount of vibration (i.e. not in the laundry cupboard!). With older wines, it is especially important that they are kept still so that any sediment that has formed has settled and so when you come to decanting your wine it is easy to remove any unwanted sediment from your ready-to-drink, mature bottle. Note: if you are planning on pulling the cork on an old bottle, try to grab it from your cellar the day before and stand it upright so that the sediment slides to the bottom of the bottle and helps ensure you get as much sediment out of the wine as possible). Now that you know the pitfalls, it’s time to start buying like a professional and storing wisely. If you haven’t got access to that elusive underground cellar or basement, there are a number of storage solutions that can help you along the way to building and storing your wines in an environment that will allow them to develop into something wonderful and rewarding. If you are planning on getting serious and investing heavily, it is worthwhile investigating professional storage. Most companies that specialise in professional storage will charge a fee per case (as well as offering insurance) and provide temperature-controlled storage to ensure that your wines will reach their peak in optimum condition. They will also create an inventory so that you can watch your cellar grow and grow but also allow you to track what you’re buying and when you should be drinking it. If you do choose to do down the storage route, be sure to shop around as some storage companies, like anything else, are better than others. For the home, if you are looking at longer term storage a wine fridge would be a good investment. There are a number of great options on the market that control temperature and humidity and come in a vast array of shapes and sizes so allow you to cater for your own personal needs. If you have a readymade cool, dark cupboard in your house then there may be no need for a fridge, but investing in a good rack is essential. There is a vast array of great value wine racks on the market - from nice simple wooden racks that hold a dozen bottles, right through to some galvanised steel treats that can be made to order to fit around your cellar/cupboard specifications and can hold as many bottles as you could dream of owning (or can fit). Whatever decision you make for storage, buying wine to cellar is a great way to treat your taste buds and ensures that you have a readymade supply of great wines that will be on hand for you to open up a special bottle for a special occasion, for impromptu visits, for dinner parties and sometimes to simply enhance the enjoyment of a rainy Monday evening.